A woman who is not fond of modern day gadgets gets a lifetime opportunity. Twenty years wasted, he will always hold my heart. I try not to say much, but I do have my own political ponderings I normally keep private. "I can shake off everything as I write; my sorrows disappear, my courage is reborn." "You never have to change anything you got up in the middle of the night to write." "You just go straight for the reality of the situation. So when I sit down to write, I find myself judging it as I'm doing it, as opposed to letting it free flow." "We write to taste life twice, in the moment and in retrospect." Hello, I am Joy , this week's drama editor. This issue is about the positives of free-flow exercises. Thank you for reading our newsletters and for supplying the editors with feedback and encouragement. Please, note that there are no rules in writing, but there are methods that work for most of us most of the time. The ideas and suggestions in my articles and editorials have to do with those methods. You are always free to find your own way and alter the methods to your liking. Writing.Com presents "Party Prompts", the iPhone app with an endless supply of dinner party conversation starters and inspirations! Get it for Apple iOS. Creative fun in the palm of your hand. My favorite type of writing is fooling around with free-flow. I usually take a pen or a ballpoint with a smooth, fluid tip and write in a notebook or a piece of paper just whatever comes. This action is similar to the automatic writing of psychics; not that I am psychic, but I love surprising myself with whatever my mind lets out. On the days when I cannot think of anything, I start with describing those things around me. My phrases, sentences, feelings, and ideas may shift, become disconnected, illogical, and stumble with a lot of mistakes, but this doesn’t matter because it is the sound of the voices within me. We writers have many voices within ourselves, but these voices are hesitant to come out, and they may not answer us when we call upon them directly. To loosen up and encourage these voices, we need to set them free from their prisons. I think the free-flow writing helps us to do that since writing means having a close relationship with oneself and then the rest of the world. Through free-flow, we learn to trust our own experiences, so we can feel our connections and find our styles and originality. If you haven’t tried free-flow writing and wish to do so, you can start small. By that I mean, you can start with only three minutes of writing. Surely, you can try writing on the computer, too, but I find longhand to be more effective. The thing is, this exercise needs to be done very often, and even on a daily basis. Quite a few writers report looking back on their free-flow work to find meaningful ideas and texts in them. This is because the writers gain freedom from other eyes watching them as the scrutiny of other people may limit their self-expression. We can do free-flow in several ways, although my favorite one is just to write whatever pops up. One type of free-flow can be taking a subject or an idea and write anything that flows from the pen on that subject. If the writer digresses in the meantime, so much the better. For this type of exercise, it may be a good idea to jot down the ideas that come to us and we don’t find the time to write them down. It may also be a good practice to make an idea-file either on the computer or in a notebook. This way an idea can be chosen later for the everyday exercise. Sometimes, we can become so inspired by an idea that we cannot wait to write more on it. In that case, we may be able to produce only a few sentences or a page or two. This is fine, too, because it will grant us the confidence in our writing. Then, if writers cannot think of an idea by looking into their own lives, they can always search the lives of other people, people they know or even people in history because as writers we have the right to write about our own experiences or someone else’s as we please, as long as we hide the names and exact events. I find that my life experiences are never used up. Still once in a while, the ideas in books and other places can inspire me. Prompts are also other ways to open uncharted territories, especially those prompts that may be asking private and personal data. Regardless of how we use free-flow exercises, their most important benefit can be silencing those critics inside ourselves. When we write non-stop, we may be able to stop judging ourselves and our inner critic that always tries to obstruct our stream of thought, and I suspect writer’s block to be the culprit of our hidden, inward judging. As important as self-criticism is, I think judging our own writing has to come much later during the more serious stages revisions. Looseness in writing is essential and free-flow exercises may just be what our writing needs. A sort of free-flow poem, perhaps better described as a collection of thoughts. From the winter of '04 to present. A blizzard of thoughts. This work is that blog. All my "Daddy's Girl" stories in one easy place! Submit an item for consideration in this newsletter! Have an opinion on what you've read here today? Then send the Editor feedback! Find an item that you think would be perfect for showcasing here? Submit it for consideration in the newsletter! Don't forget to support our sponsor! Party Prompts, the App! for Apple iOS. Feedback for "The Importance of Family as Subject"
I like your clear style. I'm into a writing project right now where the core of the protagonist's inner problems are due to her family's dysfunctional behavior. The idea comes from a friend I had long ago whose family was causing her problems. Yes, I'm being careful to hide some of the elements of this drama. Thank you for your input and answering the question. Friends we know well enough always provide good material. My published novel is based on a family event I read here on WDC. I changed everything about the story except family incident and the town's reaction. I used the fact the writer didn't know anything about the story other than what he'd been told. So my main character, the grandson, goes on a journey to find his grandmother and why no one knows what happened to her. When he discovers the townspeople won't talk about her or what happened, the story gets more interesting. Thank you for your answer and for the feedback. Your novel sounds like a great piece of writing. It works well when we change the names and places. I have even changed the countries, once. Don't Be Shy! 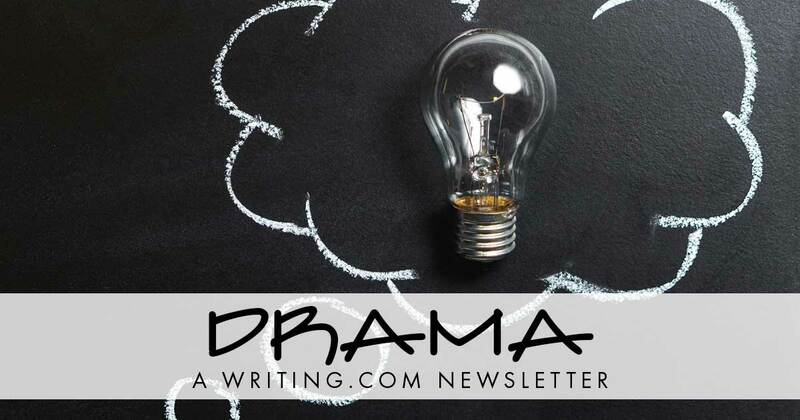 Write Into This Newsletter! This form allows you to submit an item on Writing.Com and feedback, comments or questions to the Writing.Com Newsletter Editors. In some cases, due to the volume of submissions we receive, please understand that all feedback and submissions may not be responded to or listed in a newsletter. Thank you, in advance, for any feedback you can provide! Send a comment or question to the editor! To stop receiving this newsletter, click here for your newsletter subscription list. Simply uncheck the box next to any newsletter(s) you wish to cancel and then click to "Submit Changes". You can edit your subscriptions at any time. Generated in 0.45 seconds at 6:54am on Apr 25, 2019 via server WWW2.